This year’s event is an excellent chance for your business to meet the new Economic Development Team at the councils, and to see how we are working to develop the local economy. The free-to-attend event will also have various speakers from the local business community, but most importantly an opportunity to network with all kinds of businesses, large and small, across the two districts. 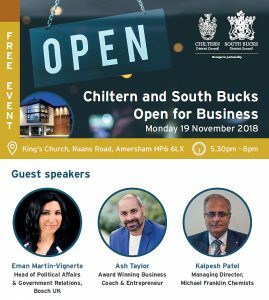 The keynote speakers for this year’s event have been chosen for their extensive links to the local business community and are best placed to explore how Chiltern & South Bucks are ‘Open for Business’. Kalpesh Patel – Managing Director, Michael Franklin Chemists, Amersham. Ash Taylor – Award Winning Business Coach and Entrepreneur. Eman Martin-Vignerte – Head of Political Affairs & Government Relations, Bosch UK. There will also be optional workshops from Bucks Business First, KG Marketing and Ash Taylor surrounding growing your business and the support available, as well as a chance to ‘ask the council’. The evening will also consist of a light buffet and refreshments. Please contact psalmon@chiltern.gov.uk or 01494 732171 with any questions.